According to the 2012 estimates, there were 100,000 Mennonites living in Mexico (including 32,167 baptized adult church members), the vast majority of them, or about 90,000 are established in the state of Chihuahua, 6,500 were living in Durango, with the rest living in small colonies in the states of Campeche, Tamaulipas, Zacatecas, San Luis Potosí and Quintana Roo. Their settlements were first established in the 1920s. 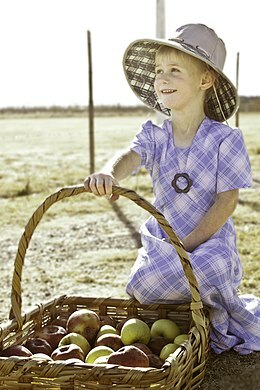 In 1922, 3,000 Mennonites from the Canadian province of Manitoba established in Chihuahua. By 1927, Mennonites reached 10,000 and they were established in Chihuahua, Durango and Guanajuato. In 2012, about 1,500 Mennonites left Durango and moved to Canada due to severe droughts in Durango. The ancestors of the vast majority of Mexican Mennonites settled in the Russian Empire in the late 18th and 19th centuries, coming from the Vistula delta in West Prussia. Even though these Mennonites are Dutch and Prussian by ancestry, language and custom, they are generally called Russian Mennonites, Russland-Mennoniten in German. In the years after 1873, some 7,000 left the Russian Empire and settled in Canada. In the period leading up to and during World War I, governments in the Canadian provinces of Manitoba and Saskatchewan passed laws requiring public schools to fly the Union Jack, required compulsory attendance, and created public schools in areas of Mennonite settlement. In response the more conservative Mennonites sent out delegates to a number of countries to seek out a new land for settlement. They finally settled in a tract of land in Northern Mexico after negotiating certain privileges with Mexican President Álvaro Obregón. Approximately 6,000 of the most conservative Mennonites eventually left Manitoba and Saskatchewan for Mexico. The first train left Plum Coulee, Manitoba, on March 1, 1922. Between 1922 and 1925, some 3,200 members of the Reinlaender Gemeinde in Manitoba and 1,200 from the Swift Current area left Canada to settle in Northern Mexico on approximately 230,000 acres (930 km2) of land in the Bustillos Valley near present-day Cuauhtémoc, Chihuahua. The Manitoba and Swift Current area groups settled the Manitoba and Swift Colonies in Chihuahua, while about 950 Mennonites from the Hague-Osler settlement in Saskatchewan settled on 35,000 acres (140 km2) in Durango near Nuevo Ideal. In 1927 some 7,000 Mennonites from Canada lived in Mexico. After 1924, another 200 Mennonite families (some 1,000 persons) from Soviet Russia, tried to settle in Mexico. But in the end only 6 out of the 200 families from Russia remained in Mexico. Between 1948 and 1952, some 595 persons of the Kleine Gemeinde in Manitoba bought and settled the Quellenkolonie. They were joined by 246 Old Colony settlers from Manitoba and Saskatchewan, but most of these settlers either soon returned to Canada or left the colony. The Mennonites established farms, machine shops and motorized vehicles for transporting produce (although automobiles were forbidden for common use). Canadian oats, beans and corn were the main produce. The villages followed Mennonite architectural styles existent in Russia and Canada and the names were based on former names in Canada such as Rosenort, Steinbach and Schönwiese. The colonies were based on former Mennonite social structures in terms of education, similar prayer houses and unsalaried ministers. Conservative dress and traditional roles for women were the norm. In Chihuahua, Mennonites continue their lifestyle with several reforms, such as the use of automobiles. They coexist, learning Spanish and English and living side by side with the Castizo in the hill country of the state. During the harvest season they employ a considerable number of Tarahumara people from the nearby Copper Canyon area. About 50,000 Mennonites reside near the city of Cuauhtémoc in Chihuahua. In Durango, there are 32 Mennonite communities (30 in Nuevo Ideal Municipality and 2 in Santiago Papasquiaro Municipality). Mennonites in Durango number reached a top of 8,000 in 2011, now they are 6,500; most of them live in Nuevo Ideal. Nuevo Ideal's lies around 77 miles (124 km) north of the city of Durango. Once in Nuevo Ideal, it becomes central transit point where the main roads that communicate Northwest and Northeast Durango separate (the road going northwest to Santa Catarina de Tepehuanes is paved while the one going to Escobedo, Durango towards the northeast, is a dirt road). Mennonites benefit from this transit point since many travelers and truck drivers stop in Nuevo Ideal in search of Menonita Cheese. The community of Chihuahua separates themselves into "conservative" and "liberal", with the liberal faction accounting for 20% of the population. This group is more open to outsiders and as such, more likely to marry outside of the community than their conservative peers. It is also more common for this group to adopt Tarahumara and Mestizo children. These children grow up as any other Mennonite would, learning German in school and helping out in the community. Since the start of the Mexican Drug War, many Mennonite colonies in Chihuahua have suffered the impact of the drug-related violence. The location of the colonies and the economic success of the Mennonites are the reasons why the community has been affected. The economic achievements have attracted the attention of organized criminal gangs, putting Mennonites at risk of armed robbery, kidnap and extortion. A small number of Mennonites have left the settlements and emigrated to other Mennonite settlements in Alberta, Canada, Belize and Paraguay to escape the violence. Thousands have moved and settled in more secure Mexican states like Campeche, or moved to South America, in countries like Argentina and Bolivia. During 2007, the colony of Salamanca (a Mennonite settlement with a population of 800 spread over 4,900 acres (2,000 ha) in the state of Quintana Roo) was completely destroyed due to the landfall of Hurricane Dean. As of 2008, Salamanca had a population of 862. A number of congregations of Conservative Mennonites have been established throughout Mexico including La Esperanza and Pedernales in Chihuahua (state), La Honda, Zacatecas, and more recently Oaxaca. The Mexican Mennonite community was the setting for the 2007 film Stellet Licht by acclaimed Mexican director Carlos Reygadas. Harry Leonard Sawatzky: They Sought a Country: Mennonite Colonization in Mexico, Berkeley, CA et al. 1971. Walter Schmiedehaus: Die Altkolonier-Mennoniten in Mexiko, Winnipeg 1982. ^ William J. Frawley (2003). International Encyclopedia of Linguistics. 1. Oxford University Press. p. 94. ISBN 978-0-19-513977-8. Retrieved 23 May 2013. ^ "Membership". Mennonite World Conference. 2014. Retrieved 27 October 2014. ^ "The Mennonite Old Colony Vision: Under siege in Mexico and the Canadian Connection" (PDF). Archived from the original (PDF) on April 4, 2013. Retrieved February 17, 2015. ^ Ens, Adolf (1994). Subjects or Citizens? : The Mennonite Experience in Canada, 1870-1925. University of Ottawa Press. p. 208. ISBN 0-7766-0390-6. ^ Krahn, Cornelius; Sawatzky, H. Leonard (1990). "Old Colony Mennonites". Global Anabaptist Mennonite Encyclopedia Online. Retrieved 23 May 2013. ^ Krahn, Cornelius; Ens, Helen (1990). "Durango (Nuevo Ideál) Colony (Durango, Mexico)". Global Anabaptist Mennonite Encyclopedia Online. Retrieved 23 May 2013. ^ a b c d Luis Fierro (2014). "Menonitas rompen tradición". El Universal. Retrieved 24 December 2014. 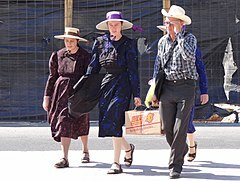 ^ "Mennonite Mob". The Fifth Estate. CBC Television. 10 March 1992. Retrieved 24 March 2017. ^ "Drug war hits Mexico's Mennonites". BBC News. 2009-11-23. Retrieved 2010-05-12. ^ "Mexican Mennonites | PRI's The World". Theworld.org. 2009-12-23. Archived from the original on 2010-09-01. Retrieved 2012-09-20. ^ "Mennonite Sentenced in Cartel Drug Smuggling Case". AOL. 2014-12-01. Retrieved 2015-08-19. ^ Ovalle, David; Merzer, Martin (2007-08-23). "Dean makes for misery among Mennonites". The Seattle Times. ^ "Menonitas, una comunidad atrapada en el Siglo XIX / Nacional". Elsiglodetorreon.com.mx. 2008-01-30. Retrieved 2012-09-20.